The tubao cloth is a traditionally handwoven cloth made by the people of Mindanao usually in the form of a handkerchief or a shawl, usually made from threads of different colors all sewn together to create its unique design. However last January 25, the tubao was not only an article of clothing, but also a symbol of unity of people banding together under one vision: change and social justice. “We are here to call for peace based on justice. We call on you to join us in our struggle. After all, our fight is not just for us but for the rest of the marginalized,” said a Lumad student. Aside from the indigenous, people of the church, activists, workers, and relatives of political prisoners and victims of President Rodrigo Duterte’s drug war were also in attendance. 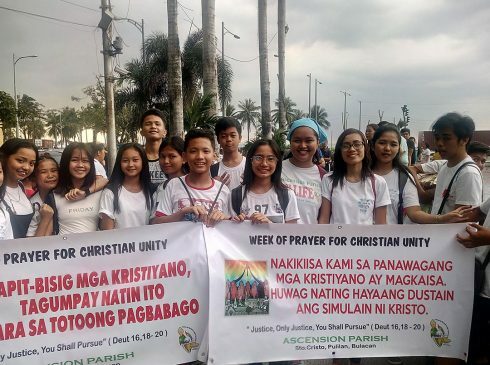 “One faith, one nation, one voice,” was an event held at the Rajah Sulayman Park organized by the church in spirit of unity and the initiative of people to stand up for human rights and democracy in the country. Movement Against Tyranny (MAT) also supported this event, lighting a “human chain” along Roxas Boulevard after the faith-based event. Will Villanueva waved the Philippine flag high in the air as people from different social standings and culture sang the national anthem, their voices as one, with hope for a better change. Villanueva is part of the group Stand Up for God, a rosary group that supports the Church on their fight. “Patak ng ulan. Pauniti-unti, para magising ang tao,” (Like drops of rain. Slowly, until the people would wake up,) said Villanueva, looking around as the park slowly filled up with people. 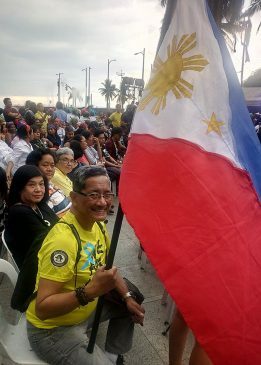 When asked why he decided to carry a flag on the event, Villanueva just said he always carries the flag to every protest movement he attends to, as a symbol of the country and his way or urging the people who sees him (especially the younger generation) to value and love the country more. Social change was also the cry of the youth from Bulacan who traveled far just to show their support for the church. Hannah, and Sharon Ramos from the Parish Commission on Youth of Parokya ng Pag-akyat sa Langit ni Hesukristo travelled all the way from Pulilan, Bulacan along with youth from the parish to show their support, and as a way of embodying the teachings of the Bible. One of the topics they were more particular about is the issue of lowering the age of criminal responsibility. People of the church were not the only ones in attendance, relatives of the victims of EJK and the indigenous people experiencing the harshness of Martial Law in Mindanao were also there to share their own stories, hoping that their call for justice will spark hope for change. Sheerah Escudero held the picture of her brother tightly in her hands as she retold the story on how her brother, Ephraim Escudero, died as a victim of extra-judicial killings back in 2017. Sheerah narrated how her brother suddenly went missing on September 19, 2017 after Ephraim told his family that he would be out for a while. After five days of searching, Sheerah and her family found her missing brother dead, by the grassland, with his head, hands and both his feet bound by packaging tape. “Hindi po siya sa usapin na ‘gumagamit,’ nasa ‘bakit may ganong nangyayare?’” said Sheerah, questioning the failing legal system of the country when it came to EJK killings. Sheerah has been part of a network called Rise Up for Life and for Right; a network of advocates and families of victims of drug-related killings founded on 2016, for over a year now. Joralyn also shared Sheerah’s sentiment. She’s been widowed for two years now, after her husband has been tagged and brutally killed under President Duterte’s drug war back in 2016, without further warning and not even a chance of redemption. “Sabi ng chairman namin, nasa watchlist daw siya, pero hindi umabot sa kaalaman naming yon, (we were never told about it)” said Joralyn about her husband’s case, adding that if she knew her husband was part of the watchlist she could’ve done something about it. Her husband’s death left her in charge of their eleven children, and she lamented on how difficult it is for her, as a single parent, to provide for all of her children’s needs. Since the government’s year-end report for 2017, Sheerah and Joralyn’s relatives were only two of the estimated 20,000 others who have been killed and put six-feet-under by President Duterte’s Drug War, none of them had undergone proper due process and were either tagged as ‘vigilante killings’ or ‘cases under investigation. 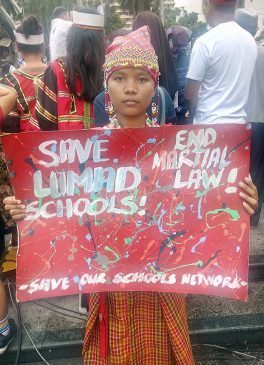 “Save the Lumad Schools. Stop the Killings. Abolish Martial Law in Mindanao,” those are the things Rorelyn Mandakawan’s group have been yearning for since last year. Mandakawan vehemently denied that Martial Law had brought peace in Mindanao. Instead it had worsened the situation of the poor and the indigenous people living in the mountains. She explained that the worst-side of Martial Law wasn’t experienced in the cities, but in the mountains. Continuous militarization where the Army holds absolute power is the main cause of human rights violations in Mindanao’s remote places. “Iyong mga sundalo sa lungsod ay pwede nating santuhin, pero sa mga bukid, hindi pwede. Ang tapang-tapang nila, berdugo talaga, (Soldiers in cities are well-behaved. But in rural areas, they kill people.) ” She explained how even the innocent and the children were not spared from the killings. Mandakawan, along with more than 90 others, had traveled to Manila since last July to find support for their cause. Their group had vowed that as long as there is Martial Law in Mindanao, they would not stop fighting and they would not stop asking the government to end it. A total of 235 lawmakers had voted for the extension of Martial Law, granting President Duterte’s request of extending Martial Law in Mindanao until the end of 2019. The participants parted ways with their hearts filled with hope.